Maria Ressa is facing prosecution for another criminal case after the Department of Justice indicted her before a regional trial court for violation of anti-dummy and security regulation laws over foreign ownership in her online news outfit Rappler. Ressa and six other executives of Rappler were charged with cases for violations of Commonwealth Act No. 108 or the Anti-Dummy Law and Securities Regulations Code before the Pasig City RTC last Tuesday. The Pasig RTC Branch 265 under Judge Acerey Pacheco set the arraignment on April 10 after several of the accused appeared before the court on Wednesday and posted bail amounting to P90,000 for the anti-dummy case ahead of the issuance of the arrest warrant. The other accused in this case are Manuel Ayala, Nico Jose Nolledo, Glenda Gloria, James Bitanga, Felicia Atienza and James Velasquez. However, Ressa has yet to appear in court and post bail as she is currently out of the country. It was learned the case for SRC violation was still being raffled to a judge as of yesterday afternoon. The Rappler officials were indicted after the Pasig City prosecutor’s office found probable cause in the complaint filed by the National Bureau of Investigation last year after foreign ownership of Rappler and its holding firm was discovered. The anti-dummy law prohibits foreigners from intervening in any “nationalized activity” such as the operation of a media company, which should have 100-percent Filipino control under the 1987 Constitution. Violators could face imprisonment for a period of five to 15 years. The Securities and Exchange Commission has canceled the business registration of Rappler and Rappler Holdings Corp. due to violation the constitutional ban on foreign ownership in media companies. It revoked Rappler’s certificate of registration because of a clause in its Philippine Depositary Receipt agreement with foreign investor Omidyar Network that it must be consulted before changing the company’s articles of incorporation or by-laws. The Court of Appeals affirmed with finality the SEC’s findings as it directed the agency to review the supervening donation by Omidyar of its shares to staff of Rappler and determine whether such move cured or mitigated such constitutional violation. 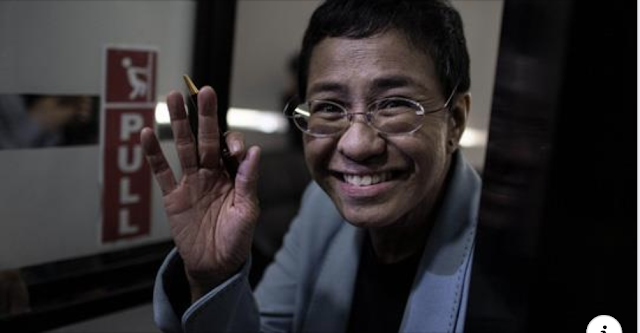 Ressa has previously been indicted in separate tax evasion and cyber libel cases. She was arrested last Feb.13 by NBI agents upon order issued by Manila regional trial court branch 46 over the cyber libel case filed by the DOJ upon complaint of businessman Wilfredo Keng. She spent the night in the NBI headquarters in Manila after failure to post bail in the evening. But she was released the following day, Feb.14, after posting P100,000 bail before the court. The DOJ found probable cause in the complaint filed by the NBI and Keng for violation of Republic Act 10175 or the Cybercrime Prevention Act in March last year. Earlier, the DOJ also indicted Rappler and its top executives for alleged evasion of taxes worth P108.4 million.